Few things hit the spot on a tipsy Saturday night better than a spicy pork and noodle dish with just the right amount of grease. This recipe doesn’t take a lot of planning either, as its short on unique ingredients and, once your mise en place is done, everything comes together in 15 minutes or so. Add 1 lb ground pork and stir fry the meat, breaking it up, until it is no longer pink but not yet browned. Meanwhile, cook in a large pot of boiling unsalted water, 1 pound chinese egg noodles (or spaghetti, if you must). Add the stock mixture to the pork, stir well and cook for 1 to 2 minutes. Add and stir fry briefly 1/2 cup of 2 inch scallion pieces, cut on the bias. Remove the pan from the heat, drain the noodles (they should only take 2-3 minutes), add to the pan and toss with the pork and sauce. Season with 1/2 teaspoon toasted sesame oil, stir well, and garnish with 1/4 cup finely chopped scallions. As I was getting into the final stretch of putting this together, I was really wondering if it was going well. As you can see above, the recipe (from Joy of Cooking) makes repeated references to stir frying, even after adding the pork. For me, as soon as I added the pork, there was way too much liquid coming out of the meat to do any stir frying, from there on out everything was being simmered in a sauce, especially once the brother mixture was added. Typically when that happens it means that your pan isn’t big enough to allow the liquid to evaporate as it comes out of the meat, or you don’t have the pan on high enough heat. In this case, I was using my widest pan and had the heat on the highest setting. Absent using a wok and a commercial grade heat source like on the badass mofos below, I’m not sure how I could solve this problem although I will be experimenting with using chicken thigh pieces rather than a ground meat to see if it releases less moisture. Either way, by adding the noodles to the pan it helped soak up some of the additional moisture and the end result was fantastic, with a soy-ish sauce, with just the right amount of spice and fresh ginger, and enough fat from the pork to coat the noodles. A good while back, I saw a link on a friends gchat status for www.skillshare.com. It’s a great site that has a ton of local classes on everything from entrepreneurship to art to cooking. After putting up gmail filters so Groupon, Living Social, and their brethren no longer dominate my in box, I started noticing the Skill Share emails again and decided it was time to sign-up for a cooking class. I picked the dumpling making class in part because it fit well in my weekly schedule and in part because I’ve never made dumplings.The instructor Cathy Erway, a food blogger and author of The Art of Eating In (a chronicle of her two years of not dining out in NYC), taught the class from her Brooklyn apartment. She was a great instructor and the class was a great break from the usual week night activities. 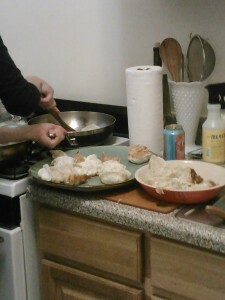 Though, as Cathy told us, unless you’re making only a handful of dumplings, you might go insane making them from scratch. Making the wrappers seems to be a simple, but time consuming process that can be replaced with store bough dumpling wrapper with minimal harm. When you buy the wrappers, be sure to get the white, round dumpling wrappers. The yellow ones are usually wonton wrapers and square shapes will just be trouble when you get to the filling stage. The biggest lesson from this class was don’t be afraid to go a little crazy with your fillings. You can keep it simple and traditional or create concoctions that will have deceased Chinese grandmothers spinning in their graves. 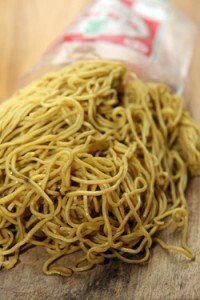 Combine all the ingredients and gently mix with a spoon or hands to evenly distribute the ingredients. Sprinkle the soy sauce and cornstarch into the mixture a small bit at the time. Be careful not to over work the meat. Cover and refrigerate for at least one hour, or up to overnight. Combine all ingredients. Swap in other raw seasonal veggies such as zucchini or summer squash shredded with a box grater. Mix everything but the cheese together, then fold the cheese in. We made the above in class and all were really tasty. My favorite was the classic. Though the cheeseburger dumplings were really fun and made me want to experiment. So you have your dumpling skin and a great filling how do make a dumpling? Lay the dumpling skin in your hand and put a spoonful of your filing in the middle. If you’re using the purchased skins, you’ll need to dip your finger in water and trace a wet ring on the outside of the skin–this what will make it stick together in the next steps. Fold the wrapper in half and pinch (so the two sides stick together) at the top. Then pull a piece of the edge about half an inch to the right of the pinch over to the pinch, repeat down the side of the dumpling and do the same for the other side. It’s a little hard to visualize, but the result should look like crescent moon. Place the dumpling seal side-up while you make some more. Cathy explained that the cooking process is really a combo of steaming/boiling and frying the dumplings. 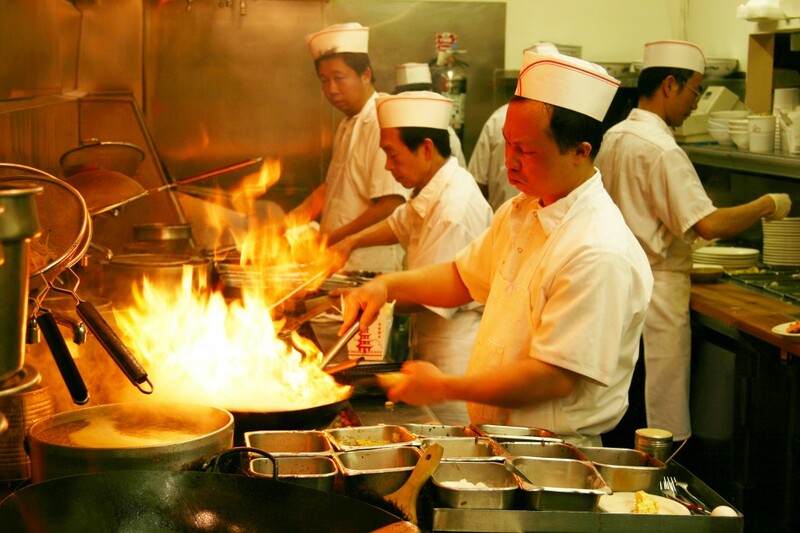 The frying is what gives dumplings that crispiness we all know and love from our favorite takeout. The steam is what gets the dumplings cooked through and through. Heat oil in a large pan. Once the oil is hot, place the dumplings, unsealed side down, into the pan. Cooking unsealed side down, rather than on their side, will help get the awesome crisp you want. Cook the little guys in the oil for two minutes or so. Add enough water to the pan to cover about one quarter of the height of the dumplings, reduce heat to medium, and cover for four minutes. (It’s time to give ’em a steam bath!) When the water is gone, crackling sounds are a clue, the dumplings should be ready to scrape out onto a plate. Serve with some soy sauce, maybe mixed with a bit of rice vinegar, and enjoy! I was first introduced to hot pot a few years back by my roommate Nick. For the uninitiated, hot pot, does, as the name suggests, involve a hot pot. On the table, you have a pot of broth or oil (or both) simmering away into which you dip all manner of raw veggies, meats, and seafood. As the dipped food cooks, it absorbs the flavor of the broth. 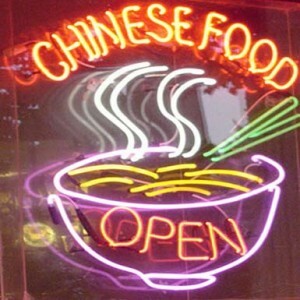 Personally, I can’t get enough of anything cooked in the spicy broth that imparts a slow satisfying burn. Not only is hot pot delicious, but it’s fun–a great time for everyone seated around the table. True interactive eating. So when a group of co-workers decided to it was time to head down to Chinatown for some of this stuff I had to say yes. Our dining location was XO Taste. What I first noticed about the place was it’s size. The dining room is spacious and well lit, the tables far enough apart that you don’t feel on top of your neighbor. The hot pot was in an all-you-can style, including non-alcoholic beverages, appetizers, the hot pot (of course), and desert for just $27. We were fortunate to have Sarina, and her impeccable Chinese language skills, to guide us through the ordering and describe items as they came out. The first wave of food, served as the pots worked their way up to a simmer, were fried dumplings and a scallop dish. The dumpling were good, better than the standard affair–more crispy with big pieces of ingredients inside. The scallop came in a way I’ve never encountered before: on the half-shell with a layer of mayo and covering of melted cheese. XO tasty, I would say, and incredibly rich. The food rolled out in waves of beef, pork, veggies, and fish. One of my favorite items were what Sarina called omega balls. Similar to dumplings, the casing is made from fish skin, these balls pack a strong fishy flavor. We ate and ate until we could eat no more. We were, tragically, beyond satiated before we got into the real seafood portion of the buffet. And then came desert. Bowls of ice cream (green tea, red bean, and vanilla were passed around), a Chinese custard (picture a gelatinous falan), a hot red bean dish, and a peanut sesame past dumpling (a fantastically savory dessert). I have to admit that Little Lamb Hot Pot in the Flushings Chinatown still leads as my belly’s number one love for hot pot. In fairness to XO Taste, I didn’t get really try their seafood. Even with seafood aside, Little Lamb seemed to have a wider array of vegetables and proteins, in addition to having a sauce bar where you came invent concoctions in which to dunk your freshly cooked treats. But, all-in-all, XO is good, cheap, fun, and conveniently located. I see return trips to XO in my future. Apologies to Meg, who apparently wants my mustard-crusted chicken recipe, but you’ll have to wait a few days. The other night, I made an interpretation of chicken stir-fried with Chinese long beans. It was probably my best re-creation of Asian cuisine so far. My favorite part of this recipe is the incorporation of dark soy sauce to raise the sugar content of the chicken marinade. When the chicken hits the pan the extra sugar will help the caramelization and develop a deep, rich flavor. For any chicken stir frying, I prefer using thighs. There’s a little more fat in them, so there’s more flavor to stand up to spicy Asian sauces, and they’re definitely more forgiving of being slightly overcooked. So buy some boneless, skinless chicken thighs or, if you have a nice boning/fillet knife, save yourself a few bucks per pound and buy the normal chicken thighs and bone them yourself. Cut 4 chicken thighs into roughly 1-2 inch chunks and add to a dish or plastic bag to marinate them. You just can't fail with these ingredients. Mix it up, add it to the chicken, toss to combine and let it marinate for 1-2 hours. Next, get a large pot of salted water to a boil. Then par-boil about 3 cups of green beans for just a few minutes, until they are bright green. Then take them out and shock them either in ice water or under a cold tap. Set aside. 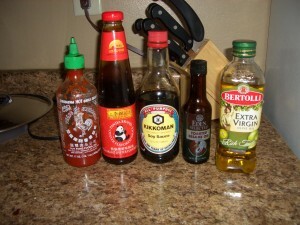 Mix 2 tablespoons of oyster sauce with 2 tablespoons of water, set that aside as well. Pre-heat 1 tbsp of light oil in a skillet over medium high heat. While that is warming up, take the chicken out of the marinade and (important) pat the chicken dry with paper towels. This will help the chicken get some browning in the pan, and will also remove most of the garlic which might burn in the pan. When the oil is shimmering, add the chicken and cook for 3-5 minutes per side or until there is some serious browning on each side. Don’t overcrowd the pan; you will probably have to separate the chicken into two batches unless you have a pretty decent size pan. When the chicken is almost done, add 3 cloves of minced garlic and a minced serrano pepper and stir it around. 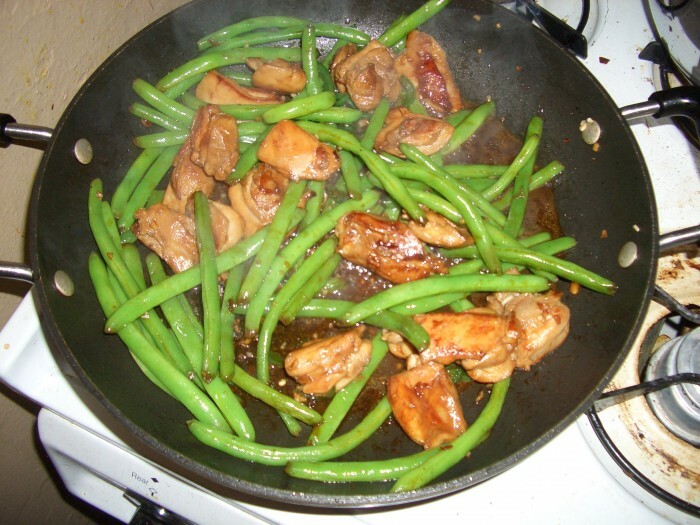 Let the garlic cook for 30-40 second, then add in the green beans and the oyster sauce mixture. Cover the pan and let it cook for 3-4 minutes. If the sauce is not thick enough, you can either take the top off and let it reduce or mix up a little water/soy sauce/cornstarch slurry and mix it in. Serve over rice or rice noodles or whatever floats your boat. Later this week: the last football post of the year. We’re breaking out the best of the best for the SUPERBOWL! It’s times like these I really wish Arty was back in the tundra, but Rick and I will have to step up and perform in his absence. I’m hoping to have about 3 appetizer recipes and maybe a review of my favorite football beers or someother such nonsense.